Winter is round the corner and so are holiday plans. We take a look at whether the Indian traveller has become adventurous since last year and if they willing to dish out more for their dream destinations. 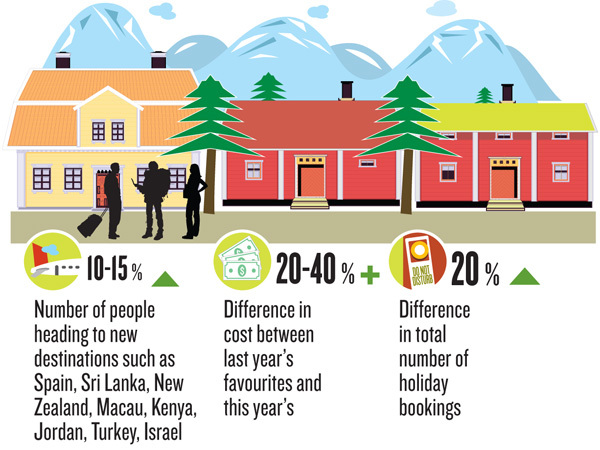 The Far East, Europe and the US remain popular, but travellers are exploring new places like Spain, Oman, New Zealand, Uzbekistan, Kenya, Jordan and Turkey. Within India, they are looking at the North East and the Andaman and Nicobar islands. And it is not just the destination that matters now. Travellers are looking for unusual experiences within known destinations too. For instance, self drives in Ireland, Malaysia and South Africa are becoming popular. But, no matter what the destination, one thing is clear: Holidays are no longer the rich man’s prerogative.